The Venerable' Bede (c.672-735), a monk of the monastery of Monkwearmouth and Jarrow in Northumbria, was this country's first great historian: his most famous work is 'The Ecclesiastical History of the English People', which he finished in the year 731. 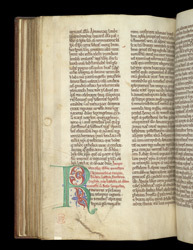 This manuscript, which contains the 'Ecclesiastical History', the 'Lives of the abbots of Wearmouth and Jarrow', and an account of Bede's own life, was owned by the Augustinian Priory at Worksop (half-way between Sheffield and Lincoln) in the late Middle Ages. The particular version of the text, and the style of the initials, suggest that it was made in the north of England; it may, therefore, have originally been made at, or for, Worksop. This initial 'R' introduces the start of the Lives of the abbots of Jarrow and Wearmouth. The flaw in the lower margin occurred during the process of making the parchment, and was sewn up with thread--which still survives--to prevent the hole getting bigger when the parchment was stretched to dry.